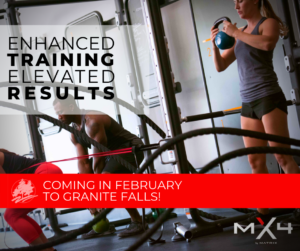 As we are unveiling the brand new MX4 Small Group Training program at Granite Falls, we wanted to explain just one aspect of why it is such a HUGE addition for those members who are really focused on fitness….well maybe we’ll give you five. First off, MX4 Small Group Training is a form of high-intensity interval training or HIIT for short, so we need to make sure everyone understands the science of HIIT. HIIT describes any workout that alternates between intense bursts of activity and fixed periods of less-intense activity or even complete rest. For example might be running as fast as you can for 1 minute and then walking for 2 minutes. Repeat that 3-minute interval five times for a 15-minute, fat-blasting workout. It sounds too simple to be effective, but science doesn’t stretch the truth and studies are showing that this is the way to go. That being said, with MX4 Small Group Training, you’ll…. Super-efficient HIIT is the ideal workout for a busy schedule—whether you want to squeeze in a workout during your lunch break or to get in shape for a fast-approaching event. Research shows you can achieve more progress in a mere 15 minutes of interval training (done three times a week) than the girl jogging on the treadmill for an hour. And according to a 2011 study presented at the American College of Sports Medicine Annual Meeting, just 2 weeks of high-intensity intervals improves your aerobic capacity as much as 6 to 8 weeks of endurance training! You’ll build a healthier heart! Most people aren’t used to pushing into the anaerobic zone (that lovely place where you can’t breathe and you feel like your heart is trying to jump out of your chest). But in this case, extreme training produces extreme results. One 2006 study found that after 8 weeks of doing MX4 type workouts, subjects could bicycle twice as long as they could before the study, while maintaining the same pace. Twice as long! You’ll lose fat NOT muscle! Anyone who has been on a diet knows that it’s hard to not lose muscle mass along with fat. While steady state cardio seems to encourage muscle loss, studies show that both weight training and HIIT workouts allow dieters to preserve their hard-earned muscles while ensuring most of the weight lost comes from fat stores. Win! In addition to increased fat burning and more muscle preserved, work outs like MX4 stimulates production of your human growth hormone (HGH) by up to 450 percent during the 24 hours after you finish your workout. Here’s what that means for you….not only do you burn more calories while you workout, the after effect of all that intense exertion kicks your body’s repair cycle into hyperdrive. 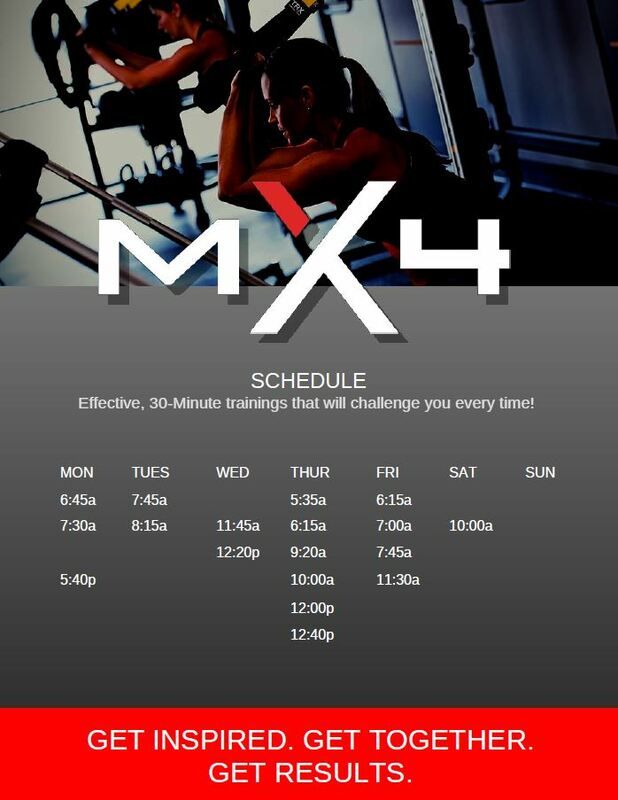 It means you will literally continue burning fat and calories for up to 24 hours after your MX4 workout! Way more effective than, say, a steady-pace run or other traditional exercise regimen. And that may not even be the best part! HGH is not only responsible for increased caloric burn but also slows down the aging process, making you younger both inside and out! Sorry, MX4 is not a workout you can do while reading a magazine or chatting with your friend. Number one because it’s so short, and secondly you’ll be working quite hard the whole time. The trade-off is the MX4 format offers seasoned exercisers a new challenge and new exercisers a quick way to see results. You may be in pain, you may be sucking wind, but you definitely won’t be bored! 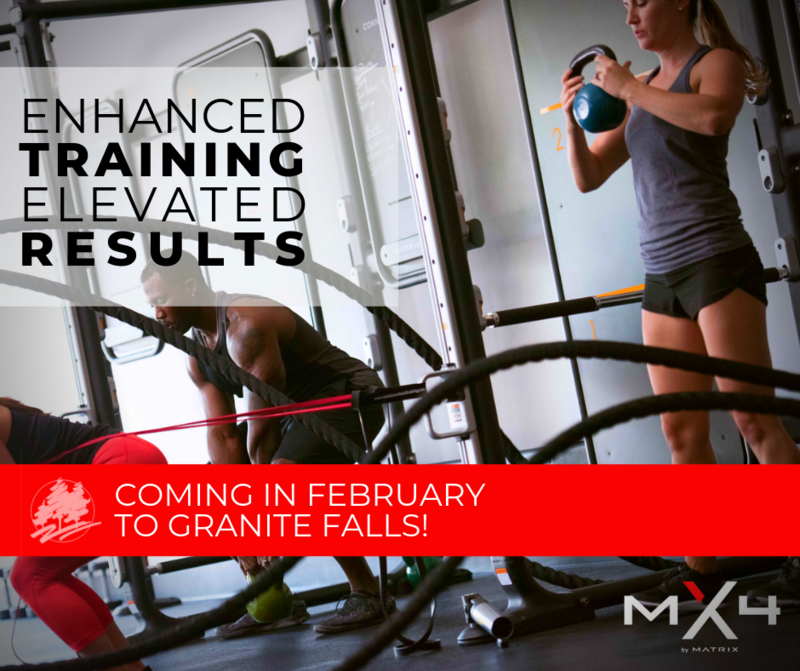 In fact, MX4 Training at Granite Falls is actually Periodized which means every month we are going to change up your workouts to challenge your body and stave off that boredom. The first week of the month you will be perfecting some new movements. By week two you will be more comfortable with the workout and you’ll be pushed to move with a bit more intensity and so on. Until week four, where you’ll be unstoppable! 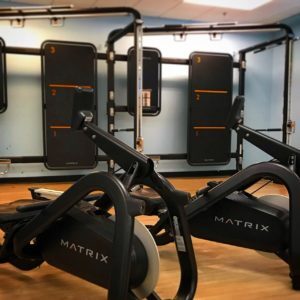 There are so many more benefits to the new MX4 Training and HIIT, and we are super excited to be able to offer it to you! Our Trainers are going through the certification process and are pumped to start leading these Small Groups. 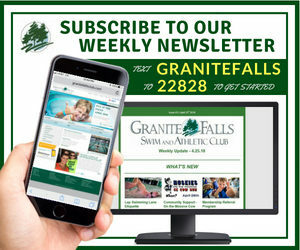 Remember, February’s calendar is loaded with free trial classes for you! So be sure to reserve a space for yourself and try a few out. We’ll see you in MX4!